Manager Ronny Deila acknowledge Emilio Izaguirre's red card was the turning point in Celtic's 2-2 draw with Ajax but was still heartened by the result. Izaguirre was dismissed for a second booking while Celtic led 2-1 in Amsterdam before Lasse Schone fired the hosts level late on. 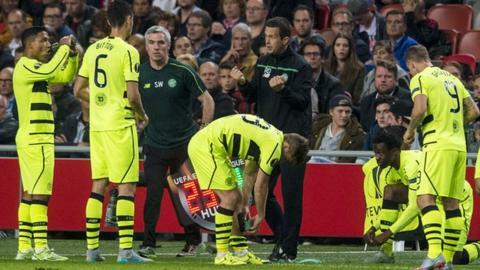 "Of course it did, we had very good control," said Deila when asked if the red card had changed the game. "I personally feel he played very well up until that red card." Goals by Nir Bitton and Mikael Lustig had given Celtic an advantage at the break, Viktor Fischer having levelled for Ajax. The Schone free-kick from the left appeared to be a cross that eluded all in the box and flew into the net a few minutes after Izaguirre received a second yellow card for fouling Anwar El Ghazi. "The boys showed me today that they really want to fight," added Deila. "We played well, we created chances and we defended as a team. We had a great attitude, I'm very, very proud of the boys. "When we get down to 10 men, we get difficulties and get more crosses into the box and had to deal with that. "In the end, if we see the whole game, a draw is OK and it's a very important point. "Emilio has no record of having a lot of red cards." Kris Commons returned to the Celtic starting line-up and set up both of their goals. "He creates things," said Deila of the midfielder. "Kris is a very good football player. He has been very unlucky this year [with injuries]. He hasn't started so many games. "Everybody knows that we can play good football and we are a good football team but today we needed performance and we needed some confidence through performances and if you can back up that with points, it makes it much easier. "We've got one point away in Amsterdam. That's something that we can take with us and can be important at the end of the group. "We really want to beat them at Celtic Park but everything is about performances. The boys have shown that they take this seriously and they've shown that they can bounce back." Deila also said debutant defender Jozo Simunovic "did very well" and added: "You can see that he's going to be a good player for us."